Algae are part of a very diverse group of organisms; some of them can be single-celled and some can be multicellular like you and me (though they are not categorized as either animals or plants). 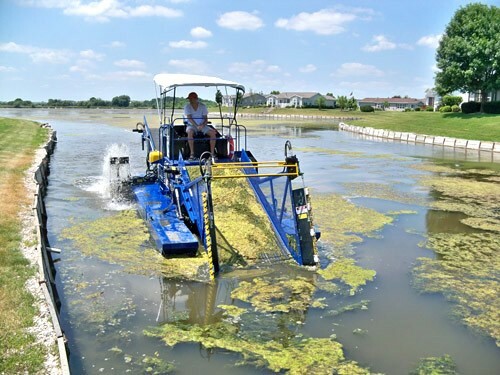 In the environment, algae can be found in ponds, lakes, streams, and oceans, but for a variety of applications (not just street lighting), algae are often intentionally grown up in ponds and farmed. 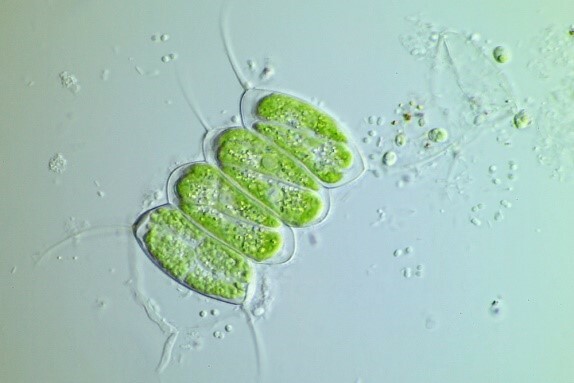 One thing that most algae have in common is that they use photosynthesis to obtain their energy. Photosynthesis is the process by which organisms use sunlight to convert carbon dioxide and water into oxygen and sugars, which organisms use for energy. Effectively, photosynthesis allows the algae to store light energy in a form of chemical energy that they can use – or that ingenious scientists can convert to electricity. So why make a lamp out of algae? One compelling reason is that the algae in the lamp can use carbon dioxide from the atmosphere, converting it to sugars and other complex molecules. As you may already know, excess carbon dioxide is an important contributor to climate change. 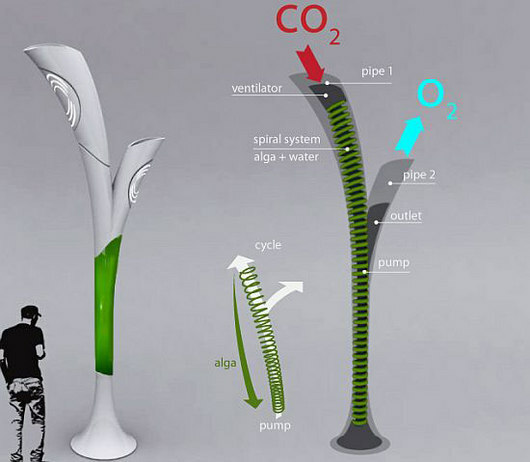 The researchers who developed the lamp shown in Figure 3 claim that it can remove 1 ton of carbon dioxide from the atmosphere per year, which is ten times the approximately 0.1 tons of carbon dioxide stored and sequestered by an evergreen ash tree in a year.2 Others have suggested that the lamp can remove 150-200 times as much as a tree.1 It has even been suggested that when the algae from the lamps die, they could be harvested and used for biofuels, which is another attractive feature of the algae lamps. These environmental benefits are one reason that algae lamps are relevant to the work of the Center for Sustainable Nanotechnology. Although algae are much bigger than nanoscale, they are a good example of new sustainable technologies that are being developed. How does the lamp work? The algae lamp takes advantage of the organisms’ photosynthesis, since its battery recharges using some of the energy produced in the process. While the details of how this process works aren’t publicized, there have been experiments that demonstrate using electrodes to capture the excited electron that is produced when light strikes the algae’s chlorophyll.3 Therefore, as long as the lamp has a supply of carbon dioxide and gets some sunlight, the battery can be charged. 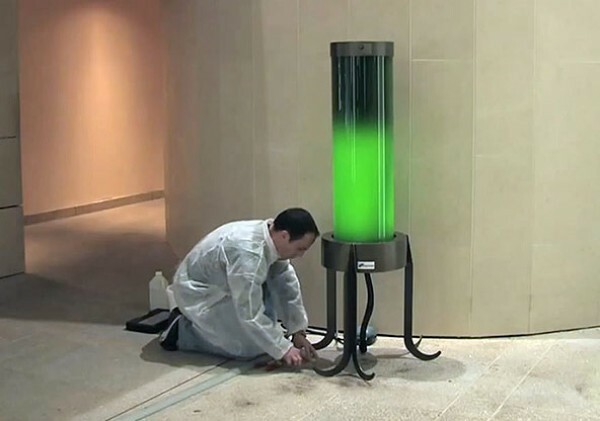 There are several designs out there for algae powered lamps, a few of which are pictured in this post. Figure 3 shows a design where the light is surrounded by a glass case filled with the algae. This causes the light to appear green since it goes through the algae-filled water. In Figure 4, you can see a smaller lamp that could be used in homes. In this lamp, the algae are housed in a glass case that is above the actual light fixture, so the light appears white. Figure 5 shows a design for a street lamp; in this lamp, the light is white although algae are enclosed throughout the fixture. Carbon dioxide is pulled into the chamber through one of the openings, and there is a separate part of the chamber with glass walls to flood the green algae with sunlight so they can perform photosynthesis. The fact that there are several different designs for algae-powered lights makes it seems like it might be a viable option and, in my opinion, would make for some pretty nifty street lights. But how practical is this idea? There are a few things that need to be worked out before we see our streets lit up with algae lamps. The maintenance involved with these lamps is not yet clear. They will need to be cleaned like fish tanks at home in order to prevent the algae from growing on the glass surface, which would prevent sunlight from reaching algae in the interior. The viability of the algae in these lamps also needs to be taken into account. Since the lamps are taking the energy that would be used to produce sugars and using it to power an electric light, the algae in these lamps may die off much quicker than their counterparts in nature. This could lead to a frequent need to replace the algae and clean out the dying algal bodies. In a similar vein, the susceptibility of the algae to extreme weather conditions will also need to be evaluated. While it’s probably too cold in Minnesota for these street lamps to be used, maybe if some of the drawbacks can be overcome, these lights will be seen decorating the streets of some communities not too far in the future. Nguyen, T.C. 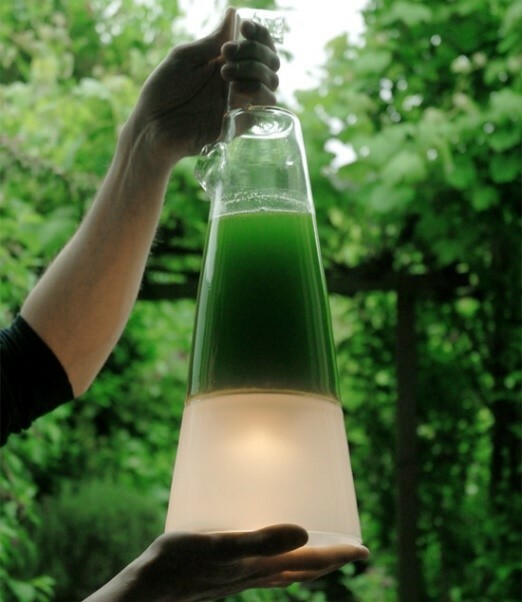 Can an Algae-Powered Lamp Quench Our Thirst For Energy? Smithsonian.com, 2013.